Hey! I know that guy!!! As I woke up I was reminded again that I could really get used to this river paddling. The camp site was so nice which results in some deep sleep. It was also nice to wake up to no blowing wind, crashing waves, flying teeth and worry about the tides. Today was starting off to be a good one and guess what, Rod’s feet were healing and doing much better. If only the rest of the UFC could be like the past couple of days. We packed our boats fairly quickly and pushed off — WITH the current — another pleasant aspect of this stage of the UFC. Up to this point in the UFC we had only had one bad encounter with wildlife and that was really my fault. It was the incident with the alligator in the Everglades. 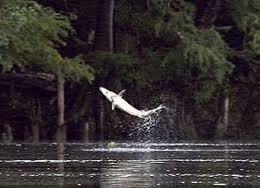 I wasn’t expecting a problem on the Suwannee River, but I didn’t know about the jumping sturgeon. A sturgeon is a fish that looks like something from the dinosaur age. There have been so many folks hurt from collisions with these fish that there are signs warning boaters about them. No one we came across knew why they jump but they do jump. We would be peacefully paddling along, the river would be calm, and then all of a sudden this massive fish would come shooting out of the water. I don’t know how deep they are in the river but they must be pretty deep to have the power to jump as high as they do. That was all we needed, to have one of these things jump out of the water and land on one of us. We must have seen no less than 30 jumps from these massive fish. 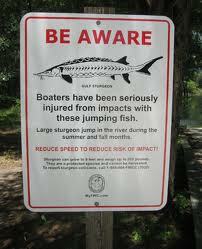 Thankfully the sturgeon decided not to use us as hurdles. Other than the jumping sturgeon, the paddle down river was very pleasant. As we approached a turn in the river we could hear folks and figured it was a local boat ramp. As we came around the bend I noticed a Sea Wind canoe. Since Sea Winds are built by Kruger Canoes in Michigan there are not a lot of them around in this neck of the woods. As we got closer I realized I knew the owner. It was a fellow WaterTriber who goes by the tribe name “Jarhead.” He had come up from Tampa and put his canoe in to cheer us on. It was great to see him and catchup on things. Interesting how an interaction with a friend can lift your spirits because Jarhead’s visit was definitely a moral boost. This ia a video he took of us. As you can tell from the video, the day was beautiful and it stayed this way for the rest of the day. As with most rivers, the Suwannee changes as you go further down stream. In the upper sections it was windy, low river banks with lots of nice sand bars to camp on. In the mid sections the river becomes wide and the river banks become steep which limited the number of camp sites. As night approached we were in our search for a good camp site. The luck we had on the two previous days in finding a site seemed to have left us. As the day light was leaving we found an aluminum dock that was a landing for a local park. The park was closed and we would be gone before it open so aluminum dock it was. Gee, an aluminum dock on the river that was just wide enough for our tents. Nothing like going from sleeping on a nice sand bar to an aluminum dock that of course had the surface roughed up so no one slipped on it. Oh, and as far as being quiet, not possible on aluminum. The biggest thing I was worried about was waking up in the middle of the night and not remembering to be careful how far I step from the tent opening or that I would lose my balance. Either situation would have resulted in a quick dip in the river. Talk about a wake up call. As I was sitting in my tent I could not stop thinking about the fact that in two more days we would be at the last checkpoint and I would see Lisa. Those nightly phone calls, even thought they were short, help in taking the edge off of not seeing her. Since my cellphone had died on the east coast I had not talked to her since Fargo and I was finding myself missing her greatly. Hopefully the next two days would be easy ones. But then that would NOT be characteristic of the 2012 UFC.